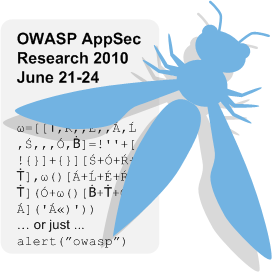 I am pleased to present to you the May 2010 OWASP Newsletter. The English version has been translated into Spanish, Greek, Hungarian, and Chinese. As always, many thanks to Lorna Alamri and her team of translators. Be sure to check out the list of upcoming OWASP Conferences! Now is a great time to plan your summer travels! The first week of June features the 3rd annual Froc event in Denver, CO USA as well as the only Application Security event to be held in Mexico! It's time to create a digital storm and invite the world to OWASP AppSec Research 2010 this summer. We have a fabulous program and will celebrate with a gala dinner at Stockholm City Hall (http://international.stockholm.se/Tourism-and-history/The-Famous-City-Hall/Events-and-receptions/Rent-the-Halls). Please consider tweeting and blogging about this Sunday/Monday. Together we'll be louder. Let's get the word out – thanks! Registration is now open at http://froc2010.eventbrite.com/ and due to the generosity of our sponsors and the dedication of our volunteers, FROC will again be a free event. We are accepting donations this year, as our expenses presently exceed our sponsorships. I look forward to seeing you at FROC2010 on the 2nd of June in Denver, CO.
Commercial Services Registry -- Live! The OWASP home page has been updated with links to the new OWASP commercial services registry! The “navigation” panel on the left-hand side of the home page has been updated with a “Commercial Services” link. And, the icon column in the center of the home page has been updated with a “Commercial Services” link and an associated text box. What is the OWASP commercial services registry? OWASP's mission is to make application security "visible," so that people and organizations can make informed decisions about application security risks, and as a value-add towards this end we have attempted to centralize OWASP project deliverable-based services in a single OWASP Commercial Services Registry. OWASP is not affiliated with any technology company, and OWASP does not endorse commercial products or services, although we support the informed use of commercial security technology, and that is the ultimate goal of this registry. To get your company listed, follow the “Get Listed” instructions on the “Home” tab of the commercial services registry page. There is currently a sample listing entry for each of the tabs.